Clawson & Ward (b. 1986/87, N. Ireland). Activities include: Scissors Cut Paper Wrap Stone, CCA Derry~Londonderry touring programme (2016-17); EBC Takeover (as part of Art Licks Weekend), The Bomb Factory, London (2016); Gone Fishing, Assembly House, Leeds (2016); EBC006, East Bristol Contemporary, Bristol (2016); Flexibilism, Catalyst Arts, Belfast (2016); SNAKE HORSE GOAT MONKEY, Guest Projects, London (2016); When Two or More are Together, SWG3, Glasgow International (2014); and Shiny Black Thoroughbred, Tenderpixel, London (2013). In 2013 they launched STUDIO36, a self-initiated residency series hosted in their studio. An accompanying STUDIO36 poster-rack publication toured to The Royal Standard, Liverpool (2014); Tenderbooks, London (2015); and Tate St Ives, Cornwall (2015). Clawson & Ward are currently enrolled in School of the Damned (Class of 2017), a free postgraduate art course run by and for its students. Tainted by an on-going curiosity in closed hierarchical networks, they selected a range of sounds, images and materials to behave as entry/exit thresholds. Their interpretations focused on single-location films and TV sitcoms, and these interior landscapes influenced their decision to develop work applying the working title EIVOM EMOH, an opposite reflection of the word ‘HOME MOVIE’. Research focused on ways of controlling an environment, be it real or fictional. Referencing everyday reactions to public spaces, they created a series of drawings hand-picked into upholstery foam, similar to marks cut into furniture, such as bus seats. The corruption of everyday objects evolved alongside experiments into Foley artist techniques. Identifying specific materials used in acts of on-screen violence, they sampled sounds and used this new perspective to generate videos and sculpture. 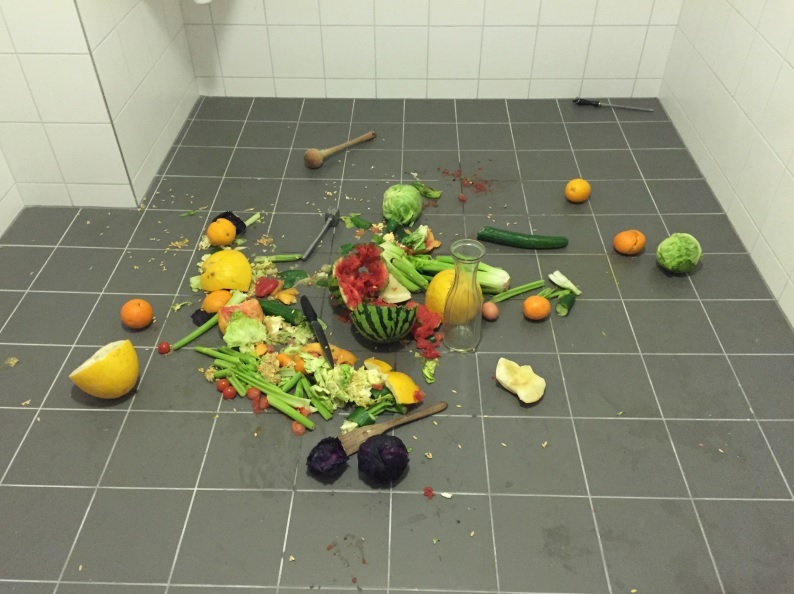 This led to an audio-visual performance, where a selection of scenes cut from feature films (showing traumas to the head), was accompanied by live choreographed vegetable-snapping.